Episcopal Church Presiding Bishop and Primate Michael Curry joined the leaders of the Anglican Church of Canada, the Evangelical Lutheran Church in Canada, and the Evangelical Lutheran Church in America in preparing Devotions for the upcoming Week of Prayer for Christian Unity. The Week of Prayer for Christian Unity is an international Christian ecumenical observance kept annually between January 18 and January 25. The theme of the 2019 Week of Prayer for Christian Unity is, "Justice, and only justice, you shall pursue," (Deuteronomy 16:18-20). T.S. Elliot Reads "Journey of the Magi"
During the January 6, 2019 Faith Forum about Epiphany we heard T.S. Elliot read his poem "Journey of the Magi" To explore and learn more read this ​guide. The page also includes a printed version of the poem. The audio version read by T. S. Eliot is below. In the Gospel of Luke Jesus asks, “You know how to interpret the appearance of earth and sky, but why do you not know how to interpret the present time?" But... do we really know how to interpret the weather? “In this first-ever English translation of The Weather Detective, Peter Wohlleben uses his long experience and deep love of nature to help decipher the weather and our local environments in a completely new and compelling way. Analyzing the explanations for Detective everyday questions and mysteries surrounding weather and natural phenomena, he delves into a new and intriguing world of scientific investigation. At what temperature do bees stay home? Why do southerly winds in winter often bring storms? How can birdsong or flower scents help you tell the time? These are among the many questions Wohlleben poses in his newly translated book. Full of the very latest discoveries, combined with ancient now-forgotten lore, The Weather Detective helps you read nature's secret signs and discover a rich new layer of meaning in the world around you." Here's to nurturing everyone's green thumb! This Wall Street Journal article date December 7, 2018 explains how people 70.5 years and older with a traditional IRA can reduce taxes by making charitable donations directly from their IRA account. According to the article "...IRA owners who are 70½ and older have the best of both worlds: They can get a tax break for donations and take the higher standard deduction. In fact, the standard deduction rises to $13,600 for singles and $26,600 for couples age 65 and older." ​You can learn more about this by talking to your financial advisor. Boundless Compassion - Creating a Way of Life by Joyce Rupp. I recommend this book for a couple of reasons. Starting Jan 21, Kaye Westmark has offered to facilitate a small group with COMPASSION a focus on spiritual growth and with conversation around the weekly chapters of this book. For six weeks, those interested are invited to meet for 90 minutes on Monday afternoons for prayer, discussion, silence and encouragement. I have no doubt, that those who join this group will move into Lent - having already experienced an incremental deepening of compassion and community. Even if you cannot attend the weekly group session - get this book if you want to individually, or with one JOYCE RUPP other person, read the short daily readings. For six weeks, each day contains a quote, the reading, a reflection, a prayer and a scripture to carry with you that day. Skillfully written, these reflections and exercises, will develop our compassionate consciousness with the behaviors to embody them. Faithful Families: Creating Sacred Moments at Home by Traci Smith. Happy New Year! Yes, Advent is the beginning of the church year and looking ahead, I'd like to suggest this book not just for your FAITHFUL FAMILIES personal collection but perhaps as a gift idea for someone you know. Newly revised and expanded, Faithful Families is put together much like a recipe book. So, it is not meant to be read straight through. Rather, it is designed as a resource to have on hand or to flip through, so you can pick out what is good and useful for a particular time. Broken into three parts: Traditions, Ceremonies, and Spiritual Practices, the book focuses on simple sacramental practices in conjunction with prayerful reflection. There are also hands on projects like building a red kite for Pentecost, which seeks to draw together multiple intelligences in community. Research has indicated that faithful spirituality starts in the home and hopefully, this resource could enrich, even supplement those practices already in place. Many Blessings. Read the main article on a congregation's contemplative practices. Life Together, by Dietrich Bonhoeffer. This month, both Fr. Nick and I, offer you books that might feed your soul. Many of you are familiar with the important work of Pastor Bonhoeffer, a renown Christian minister who resisted the Nazi movement of terror during World War II. Written from his experience of leading an underground seminary, Life Together is a must-read, at some point in your Christian walk. Bishop Russell is using this book as his premise for the upcoming Diocesan Convention in February 2019. Here, Bonhoeffer, gives us practical advice on how we might life together in community to be sustained for whatever life throws at us, the good and the bad. He demonstrates how critical community is; how life together is essential for growing in Christ and truly living. This is a thin book – easily read - and one you might consider giving as gifts to those who are looking for a book that satiates our hunger for the fullest life in Christ. Rev. Julia Gatta, shares some of the foundational wisdom she has culled from a lifetime of serving in the Anglican tradition. She does this by grounding it in the great heritage we have received from the English mystics. Applying her years of experience as pastor and spiritual director, combined with her study of the spiritual wisdom of the past, she explores common Christian practices and their underlying theology through an Episcopal lens. In the tradition of Esther de Waal, Martin Smith, and Martin Thornton, with particular reference to scripture, The Book of Common Prayer, and the wisdom of the Christian spiritual tradition, she illuminates methods readers may already be practicing and provides insight and guidance to ones that may be new to them. Mother Julia is the beloved Professor of Pastoral Theology at The School of Theology, Sewanee, TN. The corpus of her work is truly essential reading. Mirabai Bush, a meditation and mindfulness teacher who leads Google’s mindfulness training, “Search Inside Yourself,” pointed us to an illustration of contemplative practices, which shows the breadth of meditation and mindfulness within traditions. Although this list isn’t comprehensive, it does open up one’s imagination about how these disciplines take root and manifest themselves in our lives. "On the Tree of Contemplative Practices, the roots symbolize the two intentions that are the foundation of all contemplative practices. 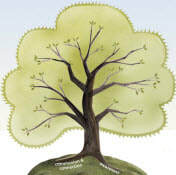 The roots of the tree encompass and transcend differences in the religious traditions from which many of the practices originated, and allow room for the inclusion of new practices that are being created in secular contexts. Seeing these classifications, I’m left wondering what else in our experiences might be part of this tree. Here’s a blank tree for your own practices. Fill it in and, if you’re willing, share it with us and others.